If you have an empty "S-shaped" tonearm similar to above, or otherwise want to make a fresh start, then you can get up and running in a jiffy with a plug n spin kit below. Each kit comes pre-tested, hand assembled, with basic alignment. You simply snap the needle onto the cartridge (if shipped unattached for protection), plug the kit it into your empty socket, adjust the tracking force weight and you are basically ready to play. More serious enthusiasts can take further steps to fine tune their setup by starting at a page such as this one. The 'Featured Products' section below contains the more popular S-tonearm kits for curved tonearms. 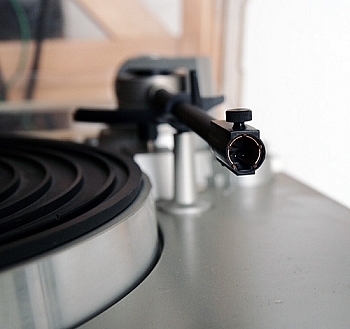 The 'Products' section contains the Japanese style straight tonearm kits.